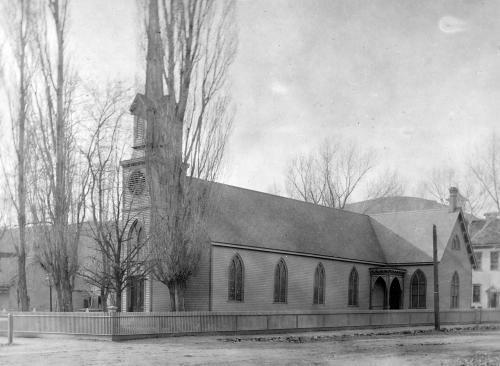 St. Peter's Episcopal Church in Carson City is seen here in the early 20th century photo. It seems to be a winter shot, since all the leaves are off the trees. The streets are not paved, and a fence surrounds the church that was removed later in the century. In the background on the right you can see part of the Central School at Minnesota and Telegraph. That places this photo prior to around 1907, when the school was torn down to build two stately homes on that corner. Source Caption: The Episcopal Church is seen in this photo from 1908.